The pin bar forex binary options trading strategy is designed to trade classic CALL & PUT (Up/Down) digital options. Buy a CALL option if you expect the asset’s price goes above the entry price of the trade, and remains higher than entry price on expiry of the trade. Buy a PUT option if you expect the asset’s price goes below the entry price of the trade, and remains lower than entry price on expiry of the trade. Download the Pin Bar Binary Options strategy for Metatrader 4. The USD/JPY chart illustrates 3 profitable trades in a row. 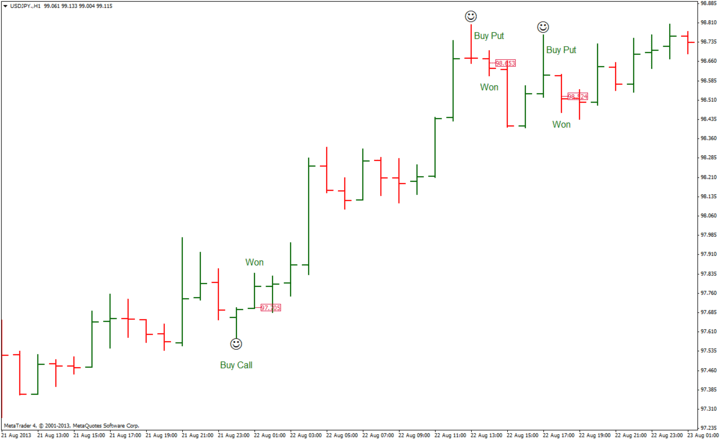 One Call trade (bullish pin bar) and two PUT trades (bearish pin bar).